Last year during the holiday season I came across the sweet potato casserole which I really enjoyed. A sweet potato casserole is essentially mashed sweet potatoes baked with a pecan and brown sugar streusel topping. I find that pumpkin and sweet potatoes can often be interchanged in recipes and since I enjoy both I was thinking that a pumpkin casserole would also be great. Normally the sweet potato is sweetened with sugar but I decided to use maple syrup to add a bit of extra flavour. This casserole is pretty easy to make, you pretty much just mix the wet ingredients and place them in your casserole dish and sprinkle on the streusel topping and bake. The pumpkin casserole turned out to be just as good as the sweet potato casserole, which is to say that it was great! It was nice and warm and creamy and sweet and the pumpkin flavour worked perfectly. I am certainly looking forward to making this again. Mix the pumpkin puree, maple syrup, milk, egg, vanilla and salt and mash. Mix the brown sugar, pecans, flour and butter. Pour the pumpkin mixture into a baking dish (or dishes) and top with the pecan mixture. Bake in a preheated 350F/180C until golden brown on top, about 30 minutes. The last two posts are making me look forward to our Thanksgiving even more. This looks absolutely mouthwatering! My mother had a friend who made sweet potato casserole very similar to the one you describe. Your pumpkin casserole sounds great; I love pumpkin pie and pumpkin anything! I just so happen to have a fresh pumpkin on my kitchen table and some maple syrup my Dad made in the cupboard. Easy, nourishing and warming for the cool Fall weather. Really great addition to a wonderful thanksgiving meal! pecans and pumpkin, oh my! Maple syrup is da bomb! Try a little coconut thrown in there too – scrumptious! that sounds and looks yummy Kevin!!! I bet this casserole would be good with rutabaga as well. Especially if you added a pinch of cardamom. Yum! Since I love sweet potato casserole, I’ll take you up on this pumpkin version and give it a try—it’s hard to resist such a festive side! wow! pumkpin casserole! I’m sure it is very very tasty! I can almost taste it! Yum! What a way to use pumpkin! WOW – I confess I have never had Pumpkin Casserole this year that will change!! 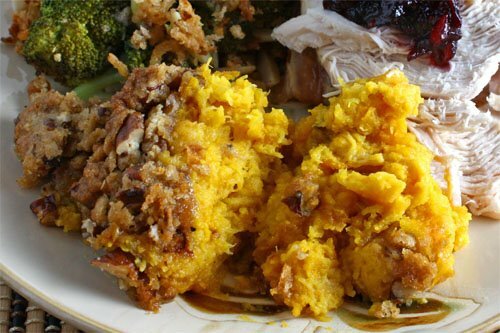 One of my favorite things about the holidays is sweet potato/squashy/pumpkin dishes! This looks divine. I have a recipe that I love like this, but it has wayyy too much sugar, I love that this one uses maple syrup instead. Printing…. I am a pumpkin junkie…your casserole looks wonderful !!! that looks delicious Kevin, especially you’ve added maple syrup to it! Looks amazing, I am making it! omg a pumpkin dish with no flour! yay! thank you! I will make this for my family! Yum. I totally want to make this for Thanksgiving this year. I love pumpkin anything. You and your clever thinking! Wonderful color Kevin! And that could go as dessert or side dish! Very nice! Happy Thanksgiving Kevin! Beautiful spread! I don’t think I’ve had pumpkin like this. But it sounds so good, and I know the kid will love it. Thanks for a great recipe, Kevin. What a nice side dish to have with turkey. It looks great. What a great idea! I make the sweet potato casserole every year. I hadn’t really thought of putting in pumpkin. Looks wonderful! I am crazy about pumpkin lately. I will have to try your casserole. Looks divine! By the way, in step 3, did you mean pumpkin mixture, or is there another potato mixture in the recipe? I really like this idea. I’m sure the pumpkin adds great flavor to the dish. What great fall recipes these are Kevin..love the idea of inter-changing sweet potato with pumkin, & the addition of maple syrup. Delish! I forgot you live in Canada–Happy Thanksgiving Kevin! As always your meals are perfect. I would love to sit down to dinner with you with all those glorious fixings. Your friends and family are lucky to have you cook for them. I wouldn’t have thought to make a pumpkin casserole like this – it sounds delicious!! I love that I get to see all of the Canadian Thanksgiving meals to help me prepare for our US Thanksgiving next month! ahh sweet potato casserole. how i love thee. I’ll even admit to a dirty little culinary secret: I ADORE it with the marshmellows on top. But that might be a midwestern American thing. At any rate, happy thanksgiving! Mmmm…this sounds really tasty! Thanks for sharing! Very festive, love the streusel topping. Oh what a great idea with the pumpkin Kevin! I love it, I will try this. cAdded to the Thanksgiving menu…thanks. what a great idea to create a pumpkin casserole with strusel on top! yum! I am collecting recipes for Thanksgiving and this definitely goes on the list! I had no idea anything could be better than sweet potato casserole, but this could do it!!! Wow, so yummy! I love cranberry desserts – this has gotta be the next one I make. So messy and delicious! Oops! Meant to post that on someone else’s blog! Awkward! pumpkin and spice and maple sugar, I know its good! What a great twist on an old favorite! I like your addition of maple. YUM! Kevin…this is a wonderful use of pumpkin. I must try it. Thanks for the idea. Hope you had a great Thanksgiving Kevin! I can see all your food was superb! I never made this before. I should start making sweet potato or pumpkin casserole on Thanksgiving. This sounds delicious. I love the addition of the maple syrup. I wish it was Thanksgiving time in the States already! I’ve had a similar version of this before and it is TDF! I love pumpkin and all the fall weather squashes. This looks just wonderful and is going on my fall to cook list! Thanks, Kevin.